Which Are the Best Vacuums for Cars in 2019? These Are the Top Rated Handheld, Cordless, and Corded Models! Cars are one of the trickiest spaces to vacuum. They have lots of different types of surfaces, from upholstery, to carpets, to leather and plastic. Cars are also full of nooks and crannies, in vents and between seats. Worst of all, it’s hard to reach your car with a vacuum. If you have an upright machine, it can be nearly impossible! Adding pet hair into the equation makes cleaning your car almost impossible. But with the right machine, it can be done quickly and easily! The best options are small but powerful, nimble and versatile enough to clean all the tricky spaces in your car without sacrificing suction. However, it can be hard to tell which ones are best for the task. We’ve done some research to help you out! We went looking for the best machines on the market, keeping pet hair control as our top priority. We’ve come up with a few recommendations which can tackle your pet hair problem conveniently and affordably. Below, you’ll find our in-depth reviews of each of our choices. We’ve also included several different options to suit different lifestyles, as well as different cars! At the bottom of the page, you’ll find our easy guide to how to choose the right one for your car. This extremely affordable handheld is perfect for cars with lots of fabric surfaces. Its powered brush head, full attachment set, and powerful motor take all the best features of full-size machines, and apply them to a miniature design. The best part is the price, which is less than the attachment sets for many vacuums! It has a powered brush head. That’s something of a rarity among handhelds, and is pretty remarkable considering it’s one of the cheapest in the market. This makes it ideal for vehicles with cloth seats and floor carpeting. It’s also great for supplementing your full-size machine around the house, with tasks like carpeted stairs, upholstery, and pet enclosures/beds. The brush head runs on an independent motor. Since the vacuum motor and brush motor are separate, you won’t lose suction power while you’re using the brushes. That’s a big advantage for the Eureka over more expensive models from Shark and other competitors. The “Riser Visor” on the carpet head allows you to clean horizontally, vertically, and at angles without any debris falling out of the machine. Previous buyers said it seemed strange at first, but soon became one of their favorite features because the added flexibility works well for stairs and vehicles. It’s extremely inexpensive. The Eureka is a light investment for a secondary machine. Plus, its powered brush head is more effective than most full-size attachments on upholstery and pet enclosures, so you’re getting some additional value for money by using it around the house. It’s corded, so it’ll never run out of power. Plus, the power cord is extra long. At 20 feet, it’s one of the longest on the market, and gives you plenty of room to clean all around your car! 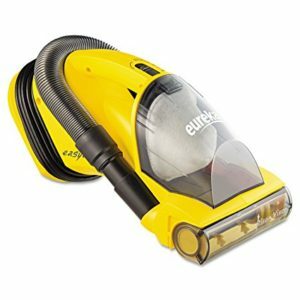 The EasyClean actually has an attachment hose and crevice for cleaning tricky spots, like a full-size vacuum would! You can clean with the wide hose, or use the crevice tool to clean in between seat cushions, or in pockets. The cord wraps around the handle for storage. It’s bagless. The EasyClean’s dust compartment detaches from it for easy dumping. You can wash both the compartment and the filters in your sink. It’s a big heavier and bulkier than cordless models. The Eureka takes a fair amount of space on your shelf. Some previous buyers said the motorized head irritated arthritic wrists. The main suction head is fairly large, so it’s not great for tighter spaces. While wide coverage means you can clean seats and mats more quickly, it does limit the EasyClean’s ability to fit between seats and in seat pockets or footwells. You’ll need to use the crevice tool for those spots. While it is bigger overall than other handhelds, it doesn’t have a larger dust compartment. It’s fairly loud. That’s a given with any handheld vacuum, and the Eureka is no exception. 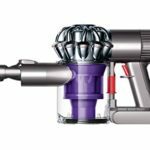 This high-powered handheld vacuum from Dyson provides lots of suction for blasting through the pet hair in your car. Consumer Reports consistently ranks the V6 at the top of its list of the best handheld vacuums. It’s perfect for people with leather car seats, or people who want cordless convenience without sacrificing power. It’s far more powerful than other handheld vacuums — 3x as powerful, according to Dyson. That’s because it uses the same radial cyclonic suction technology as Dyson’s full-size vacuums. This system creates more suction power, and uses the airflow to keep small dust and dirt away from the filters. This means suction won’t be interrupted, and you won’t have to clean the filters as often. Reviewers were very impressed with the V6’s power, and noted how consistent its performance was. One previous buyer said that it has a clear advantage over cheaper brands because it can maintain a good suction even when it’s filled up. It’s designed with ergonomics in mind. The center of gravity is located further back along the handle, so that your wrists don’t ache after using it. It’s also very light, at less than 3 1/2 pounds. It’s cordless. That makes the V6 an ideal choice for people who don’t have handy outlets in the garage, or city-dwellers who have to park in a garage or lot away from their door. Cordless power also gives you a lot more maneuverability for vacuuming on both sides of the car and in the trunk, without having to deal with extension cords and long power cables. One buyer said it’s so handy because it can be taken to the garage to vacuum floor mats without needing an extension cord. The lithium ion battery pack provides fade-free power. Unlike older nickel batteries, you won’t lose suction as the battery dies. Lithium ion batteries run at full tilt until the very last moment. The V6 will last about 20 minutes on normal settings, and 6 minutes on MAX power mode. It charges quickly, in about 3.5 hours. It has a larger dust compartment than other handhelds. That’s important, given how much debris it’s capable of pulling in. The bin opens easily, with a one-touch feature. You just hold it over the trash, and release the trap door. It comes with a crevice tool and dusting brush, as well as the standard wide nozzle. You’ll be able to clean between seats and cushions, as well as on leather and plastic surfaces. We like the bristles on the dusting brush for cleaning the dash and instruments. It loosens dust and protects electronics better than the Eureka’s hard plastic nozzles. The special Car & Boat edition also comes with a few extra tools! There’s a mini motorized brush head which is ideal for scrubbing fur and pet dirt off of seats and carpeting. There’s also a wider dusting brush for covering the dash quickly, and a “tough dirt” brush with stiff bristles to loosen up hardened mud or other tough messes. The Car & Boat edition also comes with an extension hose which you can use with any of the non-motorized tools. All in all, since it comes with so many extra tools, we think the Car& Boat version of the V6 is a way better deal (and a better pet performer!) than the standard model. If you need to do some heavy cleaning in your car, 20 minutes might not be enough vacuuming time for you. However, we’ve found that most of us tend to clean more often and for shorter amounts of time. When you have pets that commute with you, it’s especially important to keep on top of the fur situation rather than tackling it all at once, after it’s been building up for a while. It’s very expensive for a handheld vacuum. This one will cost you more than $200! The Shark is an ultralight hybrid vacuum which can clean your car, as well as the rest of your house! It coverts between a stick vacuum and a handheld vacuum, and comes with lots of attachments which make it a great bargain package. We recommend it to people who want to buy one vacuum for their house and their car. It might not be cordless, but the Rocket gives cordless range a run for its money. This vacuum has a whopping 30-foot power cord. That’s more than enough range to vacuum all around your car. 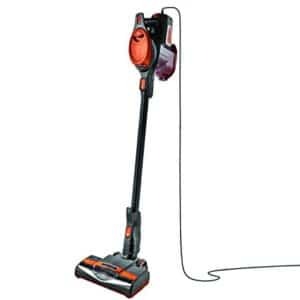 The extra-long cord also comes in handy around the house, and makes it easy to vacuum stairs and other tricky spots. The Rocket is sold with a car detailing kit. It includes variety of attachments to help you clean all the awkward places of your car. There are several mini-detail brushes which are perfect for cleaning the dash, instruments, and vents in your car. There’s also a crevice tool, full-size dusting brush, and upholstery tool. With all these tools, you can vacuum pretty much any car surface, whether your seats are leather or plush fabric. You can use all of the attachments either in handheld mode or with the extension wand. While you’re probably going to stick with the handheld mode for the car, the extra length helps for cleaning high spaces around the house. The Shark comes equipped for vacuuming your house with two separate floor heads. It has a fully-powered carpet head for cleaning even deep pile carpets and rugs. You can choose between two speed settings, a low speed for delicate rugs and hard floors, or a fast speed for deep-cleaning wall-to-wall carpet. Previous buyers were surprised by how effective the power head was on their floors, given that it’s attached to a light stick vacuum. The Rocket also comes with Shark’s DustAway dedicated hard floors attachment. It combines a wide suction head with a microfiber sweeper pad. The suction nozzle vacuums up all the loose debris, and then the microfiber cloth traps stuck-on microscopic dust while polishing your floors at the same time. Both floor heads have swivel neck joints for better maneuverability. They’re also low-profile, so they’re easier to use under furniture like couches and coffee tables. The Shark’s filters are washable, and never need to be replaced. It comes with a wall-mounted storage system. You can also use a built-in hook to hang the vacuum on a mount you already have in your house. The Rocket’s quite a bargain. Since you’re getting several vacuums in one for nearly the same price as the Dyson handheld, we think the Shark is a great bargain for people who don’t want to buy one vacuum for their house, and a whole other machine for the car. It’s covered by a 5-year warranty. That’s a lot longer than the warranty on other stick vacuums or handhelds. As a stick vacuum, it’s pretty top-heavy, because the motor is located at the handle. Some people found the ergonomics annoying to use for extended periods. It’s also a bit heavier overall than the more expensive stick vacuums, like models from Dyson. The dust chamber is a bit small if you’re cleaning a whole house. You’ll probably have to empty it several times, particularly if you have a lot of pets. It’s not the sturdiest vacuum in the world. After all, the Rocket is an ultra-light stick model. Some previous buyers said the plastic parts didn’t inspire confidence. If your car has lots of upholstery, or plush seat covers, you can read on these tips on how to clean car upholstery or we highly recommend buying the Eureka EasyClean. Its smaller powered brush head is an ideal tool for cleaning seats, cushions, and especially the floor mats and fabric in the footwells of your car. The brush head will also help you out around the house, especially if you have carpeted pet enclosures or lots of upholstered furniture. 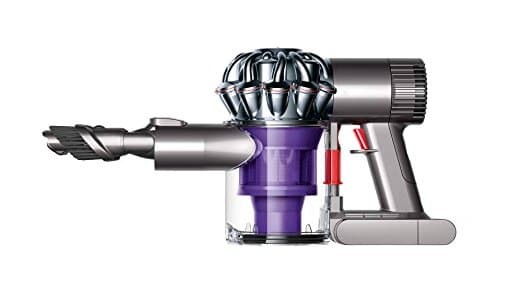 If your car has leather seats, or flatter fabrics like canvas, we recommend the Dyson V6. It’s much more powerful than the Eureka, and provides the convenience and range of cordless power. It’s also the better choice for people who don’t have easy access to a power source by their car. While the V6 is more expensive than some other cordless models, it’s one of the only cordless models that has the power and the dirt capacity to handle pet hair in your car. We recommend the Shark Rocket to people who want to buy just one vacuum for both their car and their house. It has the most elaborate attachment set of the three vacuums, and has an extra-long power cord, which makes range a non-issue. We’re particularly impressed with the value for money you get with the Rocket, since it includes a handheld vacuum, attachment set, and two dedicated floor heads for handling any terrain in your house. However, its handheld unit isn’t quite as powerful as the Dyson, and its upholstery brush is manual. The challenge of shopping for the right one is finding the balance between power and size. Full-size vacuums are obviously the best at sucking up pet hair and dirt, but they’re too bulky for vacuuming in cars. Conversely, lots of handheld vacuums are maneuverable, but many of them are too weak to handle lots of fur and debris. We suggest looking for the same types of suction systems in as you’d want in a full-size vacuum. Cyclonic suction and “no-loss” suction are two features to aim for in the power department. For maneuverability, we like smaller handheld vacuums with a variety of attachment sets. The more attachments, the better! After all, cars have such varied terrain that it’s hard to tackle the whole thing with one tool. You can also find special features for maneuverability, like rotating nozzles, flip-up dust flaps, and combination tools. If you have lots of upholstery, and rugs on the floor, you’ll probably want a powered beater bar, or upholstery tool. Manual tools can do a fairly good job on lifting pet hair from fabrics, but they require a bit more elbow grease. Powered roller brushes like you’d find on a full-size vacuum are your best bet for tackling persistent clumps and stuck-on hair. If you have leather seats, you’ll want to avoid stiff bristles and scrubbing brush attachments, which can damage the leather. We recommend wide, smooth nozzles, with crevice attachments that can pull up the dirt and hair which collects in between seat cushions, and in the seams. If you have a truck, or a car that gets particularly dirty, a household vacuum cleaner might not be the best choice. If you’re going to be dealing with lots of dried mud, or gravel, we’d recommend cleaning your car with a Shop-Vac. If you’re in the market for one just for your car, we recommend a handheld model. They’re the most affordable option, and can come in handy around the house for spot cleaning and small tasks. If you’re looking to buy one vacuum for both your car and house, you might want to look at a convertible, hybrid vacuum. In the last few years, quite a few models have come out which function as both stick vacuums and handheld vacuums. These are maneuverable enough to clean your car, and also give you the coverage and length to clean your floors once you’re back inside. The cheapest option for vacuuming your car is to get a small handheld vacuum, like the Eureka. Handheld vacuums start at around $20, and can cost up to $200. You can also use a Shop-Vac. Most Shop-Vacs are available for well under $100, and are great for muddy, dirty vehicles. If you’re looking to get a house and car vacuum in one package, you’ll be looking at a price tag between $200 and $400 for a convertible handheld and stick vacuum. Looking for something a bit different for a car vacuum? Check out Amazon’s top-selling handheld models or visit our page for the best vacuum for pet hair!